From all the parts which make up a personal computer, the power supply is perhaps the most difficult to properly test and review. That is because, once installed inside a system, there is no way to control and regulate the actual load of the power supply, even if proper measuring and monitoring equipment is available. Therefore, no proper testing of a power supply can be performed at all without a fully adjustable, stable load. For basic testing, most technicians are using power resistors in order to simulate a simple and (almost) steady load. Larger companies and specialists often use Automated Testing Equipment (ATE) systems, usually from Chroma or Sunmoon, which essentially are electronic loads that can run automated test patterns. However, what is an electronic load? An electronic load is a rather simple electronic configuration which acts as a “current sink”, sucking a specific current from a power supply and delivering it to the ground. There are many different types of electronic loads but there is only one useful to us, the constant current load, which will always draw a specific current from a power supply despite of any other parameters, such as the voltage. 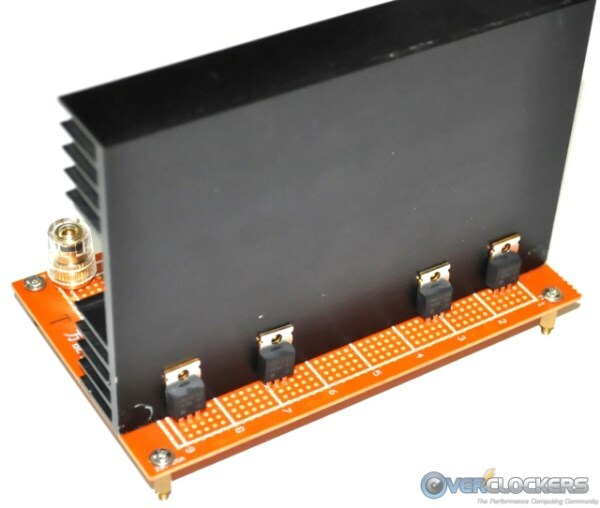 This ensures that, once set, the load will remain constant, despite of the output voltage of the power supply, which varies depending on several factors. ATE systems all implement constant current electronic loads. Witchcraft happens and, voila, there is a constant current electronic load before us. 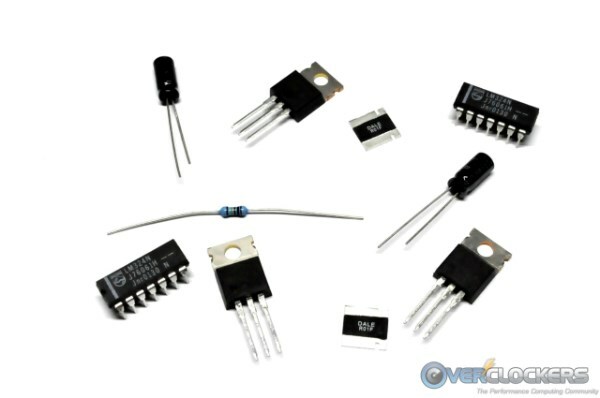 All six of our electronic load assemblies. 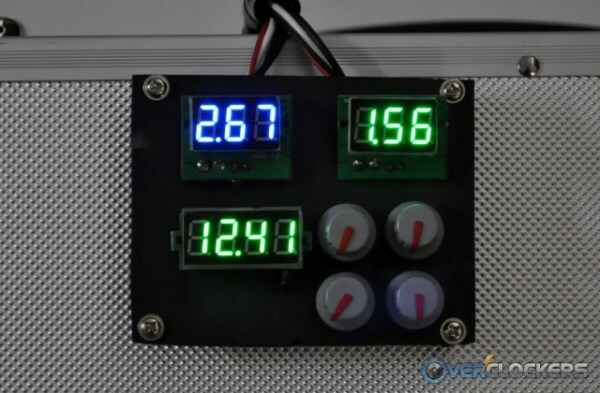 Four have been designed for the 12V voltage lines (up to 1.4kW maximum total), while two are weaker and designed for the 3.3V and 5V lines (up to 176W each). Current monitors and tuning dials. Once the power supply has been connected to the fixture and powered on, the current draw of each line can be adjusted via four simple dials (two for the 12V line, for better fine tuning). The four most important performance figures of a power supply are its electric performance, electric efficiency, operating temperatures and acoustic levels. Specialized measuring and monitoring equipment is required to take readings of each and every one of them. The electric performance of a power supply can be divided into the voltage regulation performance, which depicts how much the output of a voltage line may vary as the load changes, and the voltage ripple filtering, where lower figures depict a cleaner voltage output. Although the voltage regulation may simply be measured by a good voltage meter, provided that a controllable load exists of course, ripple measurements require an oscilloscope. Furthermore, the oscilloscope needs to fulfill certain specifications, in order to perform tests exactly as described by the ATX design guide. 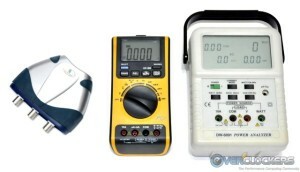 From left to right, a Stingray oscilloscope, a Mastech high accuracy multimeter and a Lutron True RMS single phase power meter. As with all energy conversion devices, the computer power supply will not output the same amount of energy which enters its input; there are conversion losses, the vast majority of which are thermal. The electric efficiency of a power supply is described as the power output to the power input, usually given as a percentage. For example, if the specifications of a 500 W power supply say that it is 85% efficient at half load (and if we assume that the specifications are absolutely correct), then at half load the power supply will output 250 W to the system but will draw 294.1 W from the outlet. The excess 44.1 W are almost exclusively heat losses, which the cooling system will have to extract from the power supply. In order to effectively measure the efficiency of a power supply, as long as the exact load is known, only a true RMS power meter is required to monitor the input of the power supply. However, the efficiency of a power supply greatly varies depending on the load and also on the input AC voltage. We are taking continuous measurements across the entire load range of the power supply units but our testing is being performed with a 230V AC input; expect slightly lower efficiency numbers if your electrical distribution grid operates at a lower (90-120V AC) voltage. 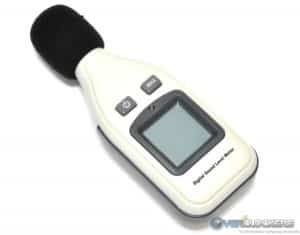 Our simple, yet effective, sound level meter. Measuring the running temperature of a power supply is relatively simple, as it only requires the monitoring of the air intake and exhaust temperatures. The higher the difference between those two, the inferior the thermal performance of a power supply is, which indicates a high level of thermal losses, a poor cooling system design or a weakened cooling profile in favor of low noise operation (or any combination of the above). The noise of a power supply can be measured from one meter away (open space) and by the use of a simple sound level meter; note however that the decibel range is logarithmic, which means that approximately every 3 dB the sound level doubles. As such, at 30-33 dB a fan is simply humming lightly, whereas at 37-40 dB whines loudly. Thus, the above mentioned electronic loads and metering equipment now allow us to effectively and efficiently test any computer power supply, on the same level as any testing center. Stay tuned for power supply reviews from all the top manufacturers!